New Zealand cuisine is fresh, healthy and modern – worlds away from the popular and heavily British-influenced meat and three veg diet which was widely consumed just 30 years ago. But this sort of basic home cooking hasn’t disappeared altogether. The British had a huge impact on New Zealand cuisine, but instead of finding dishes such as steak and chips or meat pies on the menu today, most restaurants in New Zealand embrace fusion food, taking the same ingredients used to make such classic dishes, but combining them with exotic spices and innovative cooking techniques to create something that is at the same time comfortingly familiar and yet fascinatingly new. New Zealand cuisine began with the indigenous Maori when they arrived on the island from Polynesia, bringing with them kumara (sweet potato), taro (a starchy root vegetable) and ti (a variation of asparagus). Since these plants only grew well in the very north of North Island, the Maori became dependent on native New Zealand plants such as fernroot, along with insects like the huhu grub. Birds and marine animals wreaked havoc with the local farms, so much so that the flightless moa birds were hunted to extinction by farmers protecting their crops. 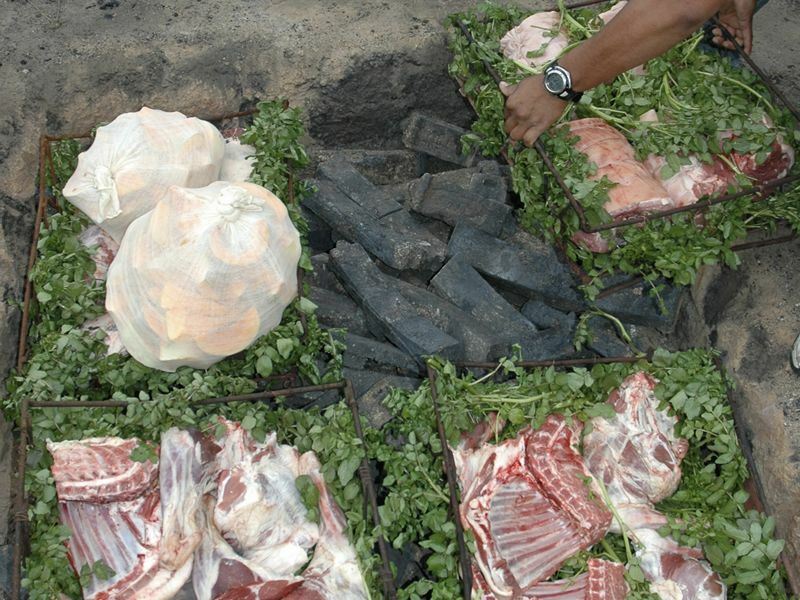 Like most Polynesians, the Maori cooked food in earth ovens, a technique known as Maori Hangi in New Zealand, which is something still practised on the island to this day. In the 19th century, British settlers arrived in New Zealand and tried their best to reproduce as many British recipes as they could. This was extremely difficult in the beginning, because very few familiar ingredients were available. The European settlers (known as Pakeha settlers) weren’t as concerned about recreating the taste of home and happily ate the native birds and fish. Since their usual ingredients weren’t available, the Pakeha often used unconventional plants to brew tea and beer, but – as the population grew and these missing ingredients were mass-imported or produced on the island – substitute ingredients became less necessary as the years wore on. Scotland provided the biggest number of British ancestors of today’s Pakeha, something which can be seen if you look at the type of sweet foods and baked goods New Zealanders prefer. Most of the biscuits, cakes and scones you find available in local bakeries today have a strong Scottish influence. For most of the 20th century, New Zealand cuisine was primarily made up of British food, but that all changed in final few decades. By the 1960's, air travel was more affordable, which allowed locals to leave New Zealand and discover new, exotic cuisines. Many New Zealanders travelled to Europe were they came upon French and Italian cooking, as well as Chinese and Indian restaurants in Britain. Motivated by the variety they’d experienced abroad, New Zealanders returning home demanded a better quality of food and increased variety. The island’s immigration laws were toned down in the 1980's which resulted in the arrival of many Asian immigrants who each brought with them their knowledge of Malaysian, Japanese, Thai, Chinese and Vietnamese cuisine, something which the locals were immensely happy about. Aspiring to change with the times and give the locals the variety that they were so passionate about, contemporary chefs such as Peter Gordon took New Zealand food to a new level by creating fusion cuisine – the practise of combining the very best local ingredients with new cooking techniques influenced by Pacific Rim culture. Maori Hangi is something you must experience when you’re in New Zealand. This traditional way of cooking meat, fish and root vegetables was invented by the Maori and has been used for more than 2,000 years. In ancient times, the Maori would have wrapped their raw food in leaves before cooking, but today, food is wrapped up in aluminium foil and placed in wire baskets to make everything that much easier. The food-laden wire baskets are set on hot stones at the bottom of a hole before being covered with a wet cloth. Everything is then packed in with soil to stop the heat from escaping and left for 3-4 hours, depending on the quantity of food being cooked. Waiting up to four hours for a single meal might sound a bit excessive, but it’s definitely worth it. The result is unbelievably tender meat and fish which literally fall off the bone and perfectly-cooked delicious vegetables, all of which are infused with an earthy, smoky flavour you simply wouldn’t get through any other cooking method. One of the best places in New Zealand to experience Maori Hangi first hand is in Rotorua, central North Island. The Tamaki Maori Village there offers an incredible dining experience where you can savour everything from lamb, sweet potatoes and mussels to chicken, stuffing and even dessert – all cooked in the traditional Maori Hangi way. Pavlova is a simple meringue-based dessert named after the famous Russian ballerina, Anna Pavlova. There is huge controversy as to whether the dish originated in New Zealand or Australia, but regardless of its origins, it’s incredibly popular throughout the whole of New Zealand and you’ll find it on most restaurant menus. 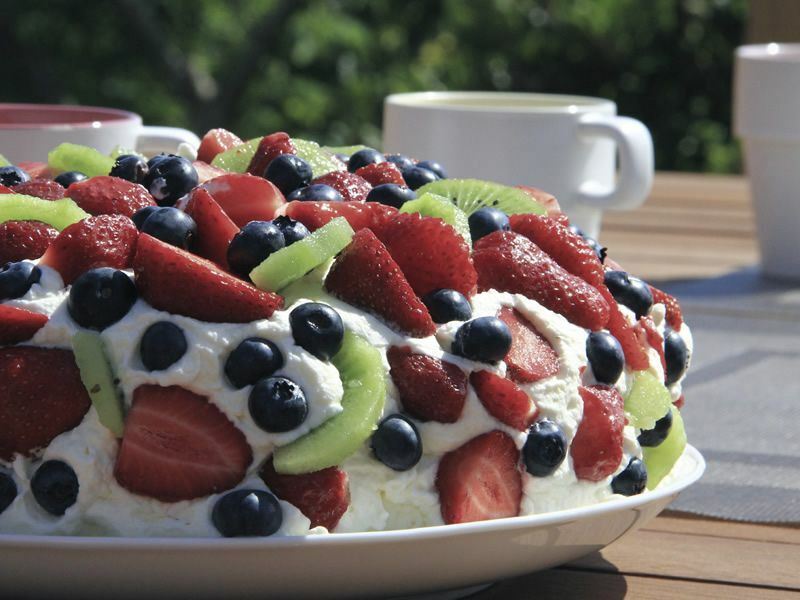 Usually topped with whipped cream and seasonal fruit (although strawberries and kiwi fruit are almost always present) pavlova is a relatively light sweet treat which lends itself to summer celebrations. New Zealand lamb is some of the finest in the world, so it’s no surprise that roast lamb is one of the country’s most iconic dishes. Usually flavoured with garlic and rosemary and served alongside a selection of seasonal vegetables, roast lamb is succulent, tender and served in all the best restaurants across the island. If you ever needed any proof that the British had a big influence on New Zealand cuisine, here it is. Fish and chips is available up and down the country, although instead of the traditional cod used to make fish and chips like it is in Britain, the dish in New Zealand is usually made by dipping snapper, terakihi or hoki in batter before deep-frying it in oil. And forget about pickled eggs or saveloys – optional fish and chip extras in New Zealand are much more gourmet and include scallops and squid rings. Another fish shop-style dish, whitebait fritters are made from tiny fish caught cooked in a frying pan with whipped up eggs until golden and puffy. The resulting dish, which is often served simply with bread, butter and a squeeze of lemon juice, is very similar to an omelette and allows the delicate flavour of the fish to shine through without masking it. Boil Ups are particularly popular in Maori communities and are always made up of different ingredients, depending on what is available at the time. The only thing that consistently remains the same is the cooking method – a selection of vegetables (usually pumpkin, potatoes and watercress) are boiled in a large pot with some pork to create a stew-like dish. This comfort food is then served up with typical Maori-style dumplings or freshly-baked bread. When it comes to award-winning wines and cheeses, New Zealand has some of the world’s finest and Hawke’s Bay on the east coast of North Island is the place to discover them. This part of the country is New Zealand’s oldest and second largest wine region, blanketed with lush, green vineyards which produce amazing Merlots, Cabernet Sauvignons and Chardonnays. Hawke’s Bay enjoys a similar sunny maritime climate to Bordeaux, which lends itself remarkably well to the creation of grapes for full-bodied reds and rich, complex whites. The region is famous for its wine tourism and samplings are available from most vineyards, large multi-regional entities and small family-owned boutique producers alike, all of which share a passion for creating nothing short of great wine. But it’s not just wine that Hawke’s Bay is well known for – this area is also renowned for its top quality cheeses which include brie, feta, halloumi, danbo and blue cheese, amongst plenty of others. The reason cheeses made in this area are so sublime is that they’re produced from cows which are allowed to roam the expansive green pastures and graze on fresh, dewy grass all day long. The cheeses you’ll find in this area are developed in an eco-friendly and sustainable way, with the ethical treatment of animals and an ecological approach to agriculture. Somehow just knowing this makes the cheese taste even better! 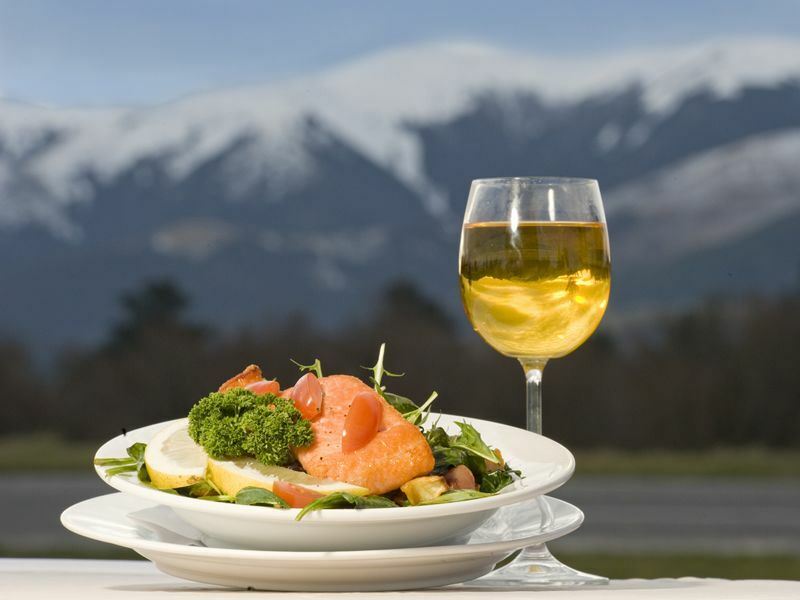 If you’re planning a self-drive holiday across New Zealand, you’ll likely be spending a lot of time eating out. Whether you find restaurants on the island cheap, reasonable or expensive is largely relative and depends a lot on what the exchange rate is when you’re visiting and in which town, city or village you are. Breakfast at a small café or restaurant can easily set you back $12-18 per person, lunch at a similar type of eatery will cost $12-$25 per person and you can expect to pay $20-$35 per person for dinner at a middle-of-the-road restaurant. These prices are all for food only – a 500ml local draught beer or small glass of wine will cost $8, a medium-size coffee costs approximately $4.50 and a 330ml soft drink or water costs around $3. There are plenty of ways to keep your food costs low when travelling across New Zealand. Tipping is not a common thing do to, so you don’t have to calculate tips into your budget. Other ways to save on eating out include choosing the daily special or fixed-price set menus, which usually offer great value for money. You can also make your budget stretch further by stopping at a bakery and ordering some sandwiches or pastries to go for breakfast or lunch, instead sitting down at a restaurant to have a meal. If you know the tips and tricks behind a no-fail pavlova, the iconic New Zealand dessert is really easy to make at home. A traditional pavlova should be thin and crispy on the outside with a soft, marshmallow-like inside – so make sure you don’t over-bake it or you’ll end up with a more meringue-like dessert which is hard and crispy throughout. After you’ve topped the pavlova with whipped cream and fruit, it will start to soften and get soggy within an hour or two, so don’t add the toppings until you’re ready to serve. This recipe takes 20 minutes to prep and 90 minutes to cook, but it needs to be left overnight to cool down. This large pavlova will easily serve 8 people.